Noelle Haegele is a Louisville native. She obtained her Bachelor of Science in Nursing from Indiana University Southeast in 1995 and went on to practice as a registered nurse for 12 years at the Louisville Veterans Administration Medical Center in the areas of internal medicine, surgical intensive care, medical oncology, and hospice. She maintains an active nursing license in Kentucky. Noelle left nursing in 2007 to attend the University of Louisville Brandeis School of Law and obtained her Juris Doctor degree in 2010. While at the Brandeis School of Law, Noelle was the Notes Editor for the Journal of Law and Education, a member of the Health Law Moot Court team, and a Marshall Brennan Fellow. From 2009-2011 she served as an intern and paralegal with Legal Aid Society of Louisville and helped to secure federal funding for Kentucky’s first civil legal assistance program for veterans. In 2012, she began her private practice at a small firm that specialized in medical malpractice defense. 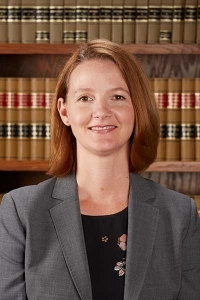 She joined PPOA in 2018 and her practice continues to be primarily focused on the defense of medical negligence claims. In her free time, Noelle enjoys volunteering as the attorney coordinator for Jefferson County Teen Court.